(2011 Jan/Feb Fic Trade) Newt's archery lesson leads to something different. Newt squinted at his target a few wolf-lengths away. The early pre-dawn darkness made his task more difficult. But after a couple of moments, the stuffed leather bag with a slaptail painted on the side came into focus� mostly. He knew the slaptail had a silly cross-eyed expression painted on its face but he couldn't make out that detail from this distance. He could, however, tell the difference between the leather bag and the gnawed stump it was in front of if he held his eyes just so. That was all he needed to move on to the next step. Trying to ignore the sounds of his friends practicing near-by, the teen raised his bow and arrow and pulled back on the string. Newt struggled to hold his position as the archer moved up behind him and made a small adjustment to his shoulders and then ran a calloused hand down his arm. "There," the black-haired elf said. "Now your stance is perfect." With the tip of his tongue sticking out from between his lips, Newt loosed his arrow. The bowstring sang and rustled his hair as it snapped back into its initial place. The arrow landed with a distinct thump. The teen scrunched his eyes tighter, trying to make out where the arrow had hit. He saw a smudge of light grey high up on the blurry flank of the slaptail. His shoulders slumped. His arrow was embedded near where the creature's tail joined his body and wouldn't have done any real damage if that had been an actual animal. And if his target had been anything of size, that shot would have just annoyed the beast and sent it on a pain-fueled rampage which would probably kill someone. And it would be all his fault. Newt shook his head sadly. Longshot slapped him good-naturedly on the back. "Good shot, Newt! You hit the target! You're getting better every time." Newt looked up and managed a weak smile in response to his teacher's wide grin. He opened his mouth to down-play the small success, but a loud shout of indignation behind him interrupted him. "Hey!" Otter shouted while Crackle giggled uncontrollably. Fadestar leaned against a tree nearby, trying to hide her own smile behind her hand. "That was supposed to be a rabbit! You were only supposed to pull on the rope a little to make it hop, not send it flying up in the air like a bird!" "You should have seen the look on your face, Otter," Crackle said between chuckles. Then, she made a face with her eyes bugged out and her lips squeezed into a tiny, surprised "o". That proved too much for Fadestar, who let loose with her own giggles, and Newt smiled in truth. Otter frowned at all of them. Longshot moved toward the other elves, blue eyes twinkling with suppressed mirth. "All right, I think we should pack this stuff up for the day. Dawn is on the way and we need to get back soon." He began picking up stuffed targets. Crackle, still chortling, started winding the rope she held around her arm and Otter set off gathering arrows, casting irritated glances at his companion. Meanwhile, Fadestar came to help Newt find his ammunition. She shot him an encouraging smile, "You really are getting better, Newt." "Thanks for saying that," he replied. "But we all know I'll never be great at this. I just like training with all of you really. Maybe one day I'll be good enough to use a bow in an emergency� you know, if my spear breaks or something." Fadestar put a hand on his shoulder. "Keep trying!" Then, she turned her attention to the undergrowth looking for stray arrows. Newt gave his head a tiny shake. He had seen four hands of summers so he was not a little cub to just believe such platitudes. He had been training for more than a full turn of the seasons and there was very little improvement. But he was building strength in his chest and arms and enjoying his time with the other teens. So it wasn't a complete loss. Shortly, Crackle called to them from across the clearing. "Otter and I are going for a swim to cool off before it's time to turn in. Are you two coming?" Newt frowned a little and glanced at the sky. Dawn was fast approaching and he really did not relish the thought of adding a sunburn to an already disappointing day. He looked back at his black-haired friend. "You should go, Fadestar," he said. "It's hot and you're sweaty. You should go." Newt interrupted her with a hug. "I mean it. Go. Cloudfern and Greenweave worry if I'm out too close to dawn. And someone needs to help Longshot carry the targets back." Fadestar looked thoughtful. "We could all help carry this stuff and then you and I can talk in your den while the others swim." Newt smiled and gave his friend a fierce hug. "No. I'll feel badly if you give up your fun time because I can't go too. You go with them now. We'll all go again tomorrow night way before dawn comes. Deal?" Fadestar reluctantly took Newt's hand and said, "Deal. But you are definitely coming with us tomorrow." Newt gave her a gentle push and nodded. He watched his three friends walk away. Fadestar and Otter glanced back at him, but Crackle continued on chattering obliviously. "Make sure to dunk Crackle for me!" he called. He sensed Longshot moving up beside him. The archer offered two of Newt's retrieved arrows silently and they watched together as the others disappeared into the underbrush. Longshot put one hand on the younger elf's shoulder and said, "You always put others' needs and wants before your own. Makes me proud to be your friend." Newt smiled sadly. "Thanks. But, honestly, I really wanted to go swimming too." Nodding, Longshot moved his hand to the far shoulder and gave the teen a companionable squeeze. The two then began walking toward the Holt. They walked silently for a while, Newt imagining the fun his friends would be having and Longshot lost in thought. After a time, the white-haired elf felt the heaviness of a send in the air but, since it wasn't shared openly, he couldn't tell what was said. He looked over to his companion curiously and saw a grin flash over Longshot's face. "I have another option," the archer said. "It isn't swimming, but it should cool you off and protect your skin at the same time. And it's more fun with a friend. Cloudfern and Greenweave agreed." Intrigued, Newt poked him in the side and insisted, "Tell me!" "I'm taking you to my favorite spot to get clay for body painting. It's not as dense or pure as the stuff Starskimmer gets for pottery but that's what makes it perfect for paint. Once your skin is covered with a base coat, you won't be burned by the sun. Boars sometimes go there for the same reason, you know." "I promise it'll be fun," Longshot interrupted. "Come on! I'll race you there." "How is that fair? I don't know where I'm racing to!" "Then you better catch me!" The black-haired elf darted away. Laughing, Newt broke into a run and chased after his friend. They scurried and twisted through bushes and branches and flitted from rock to rock as they crossed a stream. It was a mad scramble but Longshot's longer legs kept him just a bit ahead of Newt. 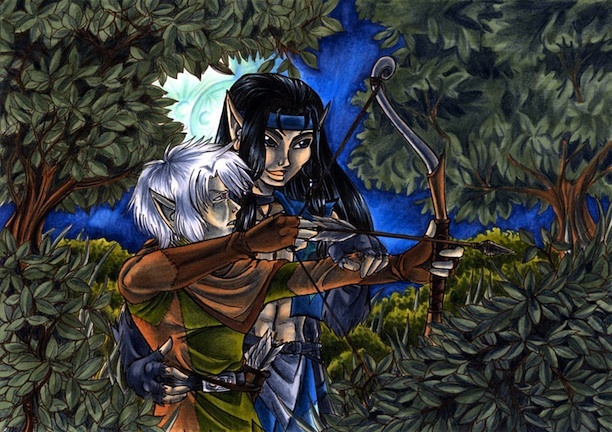 Then the archer began to slow and the younger elf put on a burst of speed so he could wrap his arms around the other's waist, knocking them both to the ground. Out of breath from running and laughing, Longshot reached out and ruffled Newt's hair. "See," he panted. You caught me� at the end." Newt shook his head. "Only because� you let me." "We were here� didn't expect� you'd tackle me." While the two sat for moment catching their breath, Newt looked around. It was a pretty place. A babbling brook cut through a tiny clearing littered with moss and pine needles. The bank of the brook was wide here on both sides and was made up of soft clay. There were divots and hollows along the bank where boars had obviously been wallowing, widening the banks even more. "Let's get out of our leathers," Longshot said. "My father would tan our hides if we ruined these needlessly. But keep on your loincloth because walking home through the forest naked is not much fun. Too many things to get snagged on." He winked at his younger friend. Newt flushed a little, but quickly slipped out of his clothing and tucked it away among their gear. He took a few careful steps into the clay, enjoying the sensation of the cool, grey-brown mud squishing between his toes. He wriggled them and watched with interest as the clay slowly slid over the top of his foot and left a streak of color across his pale skin. He took another step and nearly slipped, but managed to catch his balance. "Careful there," the taller elf said as he moved out along the bank to join Newt. "You wouldn't want to�" Longshot was interrupted by his foot suddenly shooting forward in the clay, tipping him backwards. For a moment he was all flailing arms and flying hair and then he was on his backside, sending a spray of thick clay drops skyward. Longshot looked up at him with wide-eyed surprise for a moment before he started laughing, "�end up on your tail like me." Newt wiped mud off his cheek and laughed. "I'll be sure to heed your warning, oh wise elder." "You won't be so high and mighty when you're down here with me." The archer reached up and tugged on Newt's arm, sending him sprawling in the clay, too. Newt gasped when he landed. The cool clay against his skin was a stark contrast to the heated summer air. He looked over at Longshot and smiled. "Oh, this is going to be so much more fun than playing in the river." Grabbing a huge handful of clay, he slung it at his black-haired companion. It landed on Longshot's chest with a wet splat. Then, Newt ducked as Longshot sent a glob soaring in his direction only to catch a second handful against the side of his head. The two laughed as the mud flew through the air back and forth in a gloriously messy battle. He wasn't sure how long the skirmish lasted, but Newt felt his cheeks begin to burn from sustained smiling. He decided to change up their little scuffle. He threw himself at Longshot, tackling him to the ground again. But this time, the other elf didn't just let himself be captured. They rolled and twisted, each trying to pin the other, but neither could maintain a grasp on the other's clay-slickened skin. But finally, Longshot's greater height and weight won out. Newt found himself flat on his back with his friend practically sitting on his thighs. His laughter began to taper off as he felt a warm tingle rise from his belly to burn his cheeks. Grinning, the archer leaned forward a little and Newt noted that his eyes were startlingly blue against the pale grey- brown of the clay streaked across his face. Longshot whispered teasingly, "I got you." And suddenly the pleasant tingling sensation reached the roots of Newt's white hair and then shot lower and he felt altogether too hot. He stopped struggling and just stared at his friend, his teacher. He saw Longshot's nostrils flare as if he scented something different in the air. Those blazing blue eyes widened and ensnared Newt's gaze, seeming to identify the teen as the source of the scent. Then they roved over his body before they came back to meet his own pinkish-blue eyes. The archer's smile gentled then and seemed almost welcoming. Newt shivered and licked his lips, suddenly inexplicably nervous. Longshot moved so that Newt was no longer pinned beneath him and said, "Looks like you are completely covered from head to toe in clay now. We could paint designs on each other if you want." Newt knew there was more to the offer. Longshot would cool the burn fluttering inside him if he wanted it. The young herbalist lifted his hand to touch the muscled chest in front of him. But he stopped short, feeling the heat rise off Longshot's skin. He could feel the breath in his own chest coming faster. His hand wavered there for a moment, almost touching. But he let his hand drop and looked away, too overwhelmed with these sudden sensations. Longshot reached over and clasped Newt's hand, giving it a gentle squeeze. "That's all right, Newt. Maybe we'll try it another time."